The Other Half Of The Egg If you find yourself tearing through egg yolks in the kitchen, with a surplus of whites left behind, don't just toss them out. It's the white that gives life to sweet and spicy nuts, sichuan pork and classic cookies like macaroons and financiers. 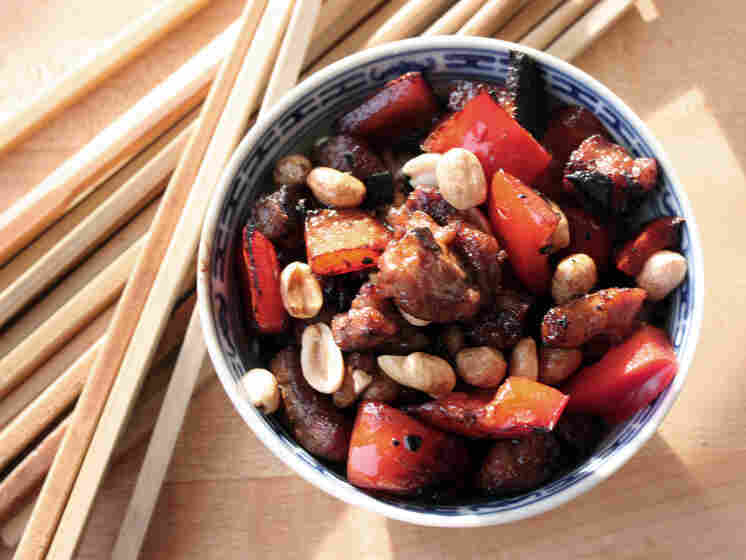 Get recipes for Spiced Nuts, Sichuan Pork With Peppers And Peanuts, Coconut Macaroons and Financiers. There are two different kinds of people in the world: those who use up egg yolks, and those who use up egg whites. I'm a yolks kind of girl. I go through yolks a half-dozen at a time for ice cream and creme brulee; I sometimes make fresh pasta dough, and I often brush my breads with an egg yolk wash. I often end up using even more for Easter's egg breads and custards, which are basically yolk-eating machines. Above all, I like my egg whites combined with nuts. You can use them to hold a spice coat on pecans. You can mix them with ground almonds to make the buttery yet airy cakes known as financiers. 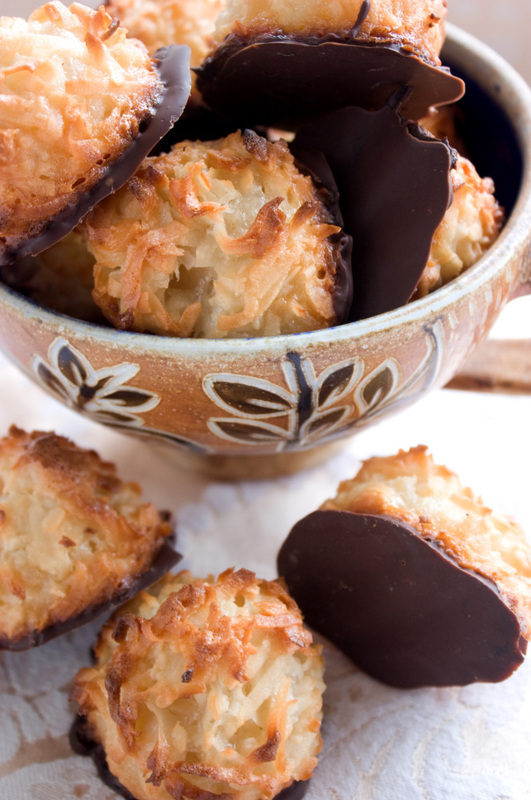 You can toss them with grated coconut to make macaroons. In addition to being the kind of person who uses up egg yolks, I am the kind of person who cannot comfortably wash the other half of an egg down the drain. I store the egg whites in a jam jar, which I keep in the freezer. You can store almost a dozen egg whites in the kind of jam jar I use, but even so, after a couple of months, I have three or four jam jars of egg whites, and the freezer is starting to run out of room for frozen vegetables and meat. Egg whites stay good frozen practically forever, which, in a crowded freezer, is a virtue that rapidly turns into a fault. It being out of the question to simply throw them out, I have over the years acquired a collection of egg white-disposal recipes. If you know your Eggs 101, you know that yolks and whites have very different properties (and I don't just mean from the cholesterol worldview, in which yolks are evil and whites saintly). Yolks are moistening and thickening, and they give baked goods a glossy golden finish. Whites are leavening and drying, and they coat food with a crackly sheen. Therefore, whites are miracle workers when you want a high, light confection from the oven. Without a doubt, the fastest way to use up most of your egg whites at once is to bake an angel food cake. You can do away with a dozen egg whites in one go, and then you're free to go make as much ice cream as you want. But personally, I don't really like angel food cake. I eat it once a year during strawberry season, and that's enough. Probably the next most efficient way to use up egg whites is to make royal icing (the type used for gingerbread). But you can't eat royal icing all by itself — that is to say, you can, but I wouldn't recommend it. T. Susan Chang regularly reviews cookbooks for The Boston Globe and NPR.org. She is also the resident cookbook reviewer for AOL's Kitchen Daily and the cookbook indexing website Eat Your Books. Her first book, A Spoonful of Promises: Recipes and Stories from a Well-Tempered Table (Globe Pequot), will be released in fall 2011. Visit her at tsusanchang.com. The recipes I've included here are a few of my favorites. Above all, I like my egg whites combined with nuts. 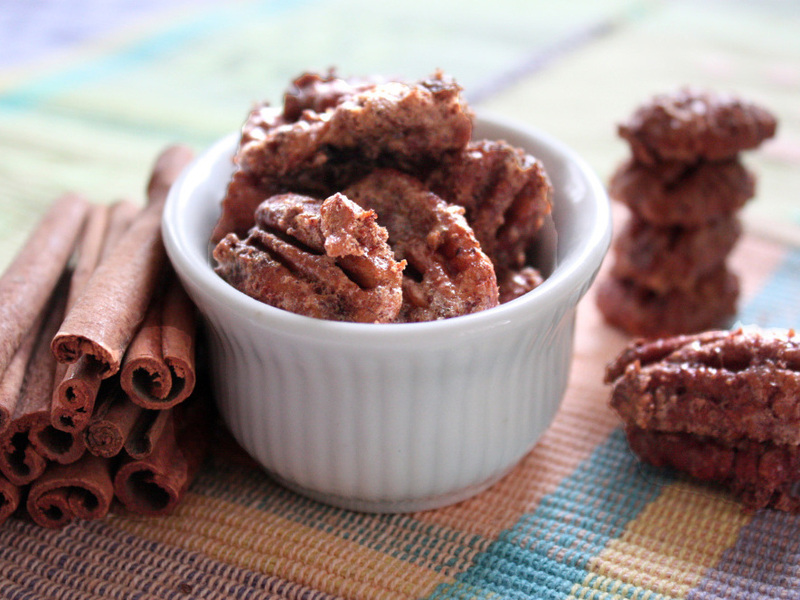 You can use them to hold a spice coat on pecans. 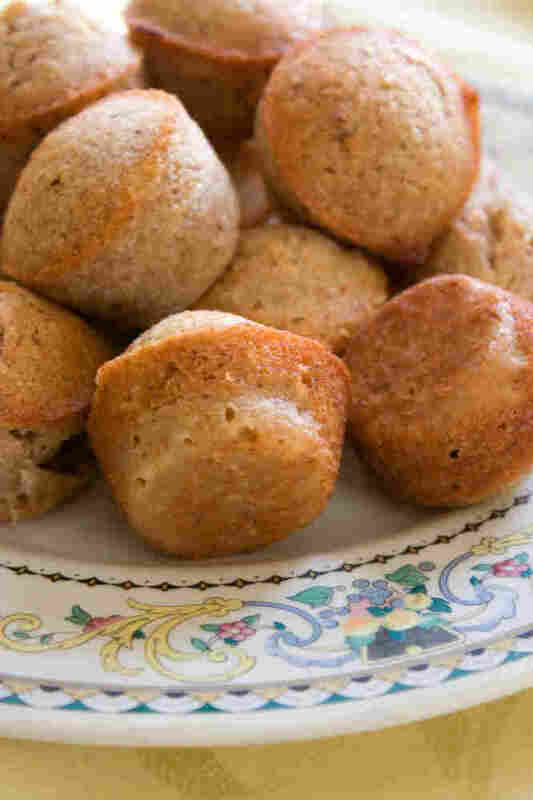 You can mix them with ground almonds to make the buttery yet airy cakes known as financiers. You can toss them with grated coconut to make macaroons. And if you've maxed out your sweet tooth, there are plenty of savory applications for egg whites, starting with the virtuous egg white omelet, but certainly not ending there. I always feel especially sly when I use egg whites in a stir-fry — you can toss chicken or pork in egg whites to achieve the silken yet sauce-trapping "velvet" texture so prized in Chinese cuisine. "But wait," you say, "I detect a problem: Egg whites normally come pre-measured, as in '1 egg white' or '2 egg whites.' How am I supposed to know how much to use if I'm dipping them out of a jam jar in a slurpy mass?" No problem. One large egg white equals 1 fluid ounce, or 2 tablespoons. If you have a measuring cup or measuring spoons, you're all set. "But wait again," you say. "How am I supposed to thaw a rock-hard 12-ounce chunk of egg white ice for my recipe?" Well, the best way is to take it out of the freezer and thaw it in your fridge overnight, or on a kitchen counter overnight if it's not too warm out. If you haven't planned that far ahead, you can put it in your microwave on its absolute lowest setting and run it for 5 to 10 minutes, to the point where about half the whites are thawed. (Don't try to thaw the whites completely in a microwave, or you'll end up cooking some — and scraping cooked egg white out of the bottom of a jam jar is no party, believe me.) Once the whites are thawed, you have three days to use them safely. There are other things you can do with whites, such as clarifying soup stock with them or crystallizing violets. You can make crispy meringues, delicate tuiles and voluminous popovers (though you'll need a whole egg or two as well for those). If you worship at the altar of cake, you can make Italian buttercream as well as royal icing. You can make a low-fat egg white batter and then dip something in it and deep-fry it (so much for low-fat). As a matter of fact, egg whites are so useful you may eventually find yourself with the opposite problem: a surplus of yolks, which do not freeze as nicely and do not last as long. If you're not in the mood to make ice cream, my best advice for you is to mix the yolks with some rum and shampoo your hair — messy, but rejuvenating. Plus, it makes you smell like zabaglione. Now, all we need is a way to use up the shells. Emily Luchetti (Stars Desserts, Chronicle Books 2007) says you can make her recipe with pecans or almonds, but I think the delicate surface texture of pecans is infinitely better suited to the cinnamony filigree that is this egg white coating. Like all seasoned nuts, they should be stored in an airtight container, in the unlikely event you have any left to store. In a bowl, whisk together the egg white and vanilla until frothy. Stir in the brown sugar, cinnamon and pecans until the nuts are evenly coated. Spread the pecans evenly on a baking sheet. This is another recipe, adapted from Stir-Frying to the Sky's Edge by Grace Young (Simon & Schuster 2010), for when you have just one egg white to dispose of. I've doubled the scale of the original recipe so it will serve four for dinner and accommodate a single large egg white (2 tablespoons); the oil is slightly less than doubled, as oil doesn't scale the same way as other ingredients. Young notes elsewhere in her wonderful book that it's very important not to use too much egg white when you're velveting pieces of meat, as they won't absorb the coating well if there's too much. I prefer 2-inch-long (1/3-inch wide) strips of pork and pepper to cubes, but either will work. In a medium bowl combine the pork, egg whites, 2 tablespoons of the rice wine, cornstarch, the 4 teaspoons minced garlic, sugar, 1 teaspoon of the salt and 1/2 teaspoon of the pepper. Stir to combine. In a small bowl combine the soy sauce, vinegar and the remaining 4 tablespoons rice wine. Heat a 14-inch flat-bottomed wok or 12-inch skillet over high heat until a bead of water vaporizes within 1 to 2 seconds of contact. Swirl in 1 1/2 tablespoons of the oil, add the red onions and the remaining 2 tablespoons sliced garlic, then, using a metal spatula, stir-fry 1 minute or until the onion wilts. Push the onion mixture to the sides of the wok, carefully add the pork and spread it evenly in one layer in the wok. Cook undisturbed 1 minute, letting the pork begin to sear. Add the chili bean sauce and stir-fry 2 minutes, mixing the onion and pork back together, or until the pork is lightly browned but not cooked through. Transfer the pork to a plate. Swirl the remaining 2 tablespoons oil into the wok. Add the bell peppers, sprinkle on the remaining teaspoon salt and 1/2 teaspoon pepper, reduce the heat to medium and stir-fry 2 minutes or until the bell peppers begin to soften. Return the pork with any juices that have accumulated to the wok, increase the heat to high, swirl the rice wine mixture into the wok and stir-fry 1 to 2 minutes, or until the pork is just cooked through. Stir in the peanuts and serve. *Shaoxing rice wine is the wine used to marinate protein in practically every Chinese stir-fry. It is available at Asian markets and some well-stocked supermarkets. However, dry sherry works just as well. Chinkiang vinegar, or "black" vinegar, is a type of fermented rice vinegar. It's also easily found at Asian groceries. Balsamic vinegar is a possible substitute, but by no means an exact one. For chili bean sauce, check the ingredients: Ideally, the first two will be chilies and "broad beans" or fava beans. Chilies and soybeans — an easier-to-find combination — are fine, too. If you cannot find any kind of chili bean sauce, use your favorite chili paste. Alice Medrich suggests you use the wide shaved flakes of unsweetened dried coconut, if you can find them, for this recipe adapted from her Chewy Gooey Crispy Crunchy (Artisan,2010). I couldn't find them, so I went with Plan B — ordinary sweetened shredded coconut from the supermarket. The macaroons were sublime — especially with a daub of melted bittersweet chocolate painted across the bottom once they've cooled. Best of all, they use up four whole egg whites — a full 1/2 cup. Combine all of the ingredients in a large heatproof mixing bowl, preferably stainless steel because the mixture will heat faster than in glass. 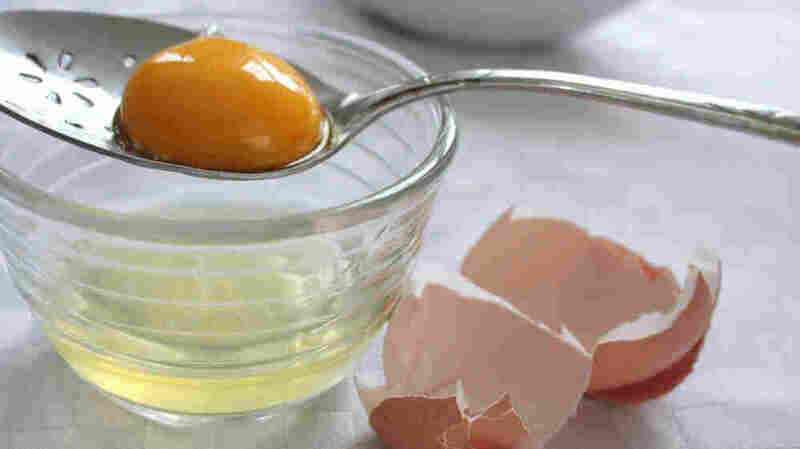 Set the bowl directly in a wide skillet of barely simmering water and stir the mixture with a silicone spatula, scraping the bottom to prevent burning, until the mixture is very hot to the touch and the egg whites have thickened slightly and turned from translucent to opaque, 5 to 7 minutes. Set the batter aside for 30 minutes to let the coconut absorb more of the goop. Using 2 tablespoons of batter, make attractive heaps 2 inches apart on the lined cookie sheets. Bake for about 5 minutes, just until the coconut tips begin to color, rotating the pans from top to bottom and from front to back halfway through the baking time to ensure even baking. This recipe is adapted from From Around My French Table by Dorie Greenspan (Houghton Mifflin Harcourt 2010). I didn't have the special little ingot-shaped rectangular molds that give these little Parisian cakes their distinctive shape, but Greenspan says mini-muffin molds will do. And so they did. I made some in a silicone tin and some in a regular nonstick aluminum pan. The metal one was preferable, giving the little cakes crisp gilded edges that contrast delectably with the moist, almondy interior. I never buy almond flour, but I always have whole raw almonds in the freezer. You can't process raw almonds finely if they're at room temperature and you grind them by themselves — they turn to almond butter before becoming finely ground. But if you put them in the food processor frozen, and add the sugar or flour from the recipe, you can achieve a very fine grind. In this recipe, I simply grind them directly with the sugar. Financiers can be made with "normal" melted butter, but if you follow tradition and brown the butter, you'll give the cakes an extra layer of flavor. To make beurre noisette ("hazelnut" butter, so called for the scent of hazelnuts the browned butter produces), cut the butter into pieces, toss it into a small saucepan and bring it to a gentle boil over medium heat. Once the butter boils, keep a close eye on it — you want it to turn a golden brown. If you get a deeper color you'll get more flavor, but you have to be careful not to let the butter go black — something that can happen quickly. When you have the color you want (and perhaps the fragrance of hazelnuts), pull the pan from the heat and set it aside in a warm place. Put the sugar and almond flour in a medium saucepan and stir to mix. Add the egg whites, stir, and place the pan over low heat. Again, never leaving the pan unattended, stir with a wooden spoon or silicone spatula for about 2 minutes, until the mixture is slightly white, runny and hot to the touch. Remove the pan from the heat and stir in the all-purpose flour, then gradually blend in the melted butter. Scrape the batter into a heatproof bowl and press a piece of plastic wrap against the surface of the batter. Chill the batter for at least 1 hour, or, better yet, overnight. (You can keep the batter in the fridge for up to 30 days). When you're ready to bake, center a rack in the oven and preheat the oven to 400 degrees. Generously butter 18 mini-muffin molds, dust with flour and tap out the excess. Place the molds on a baking sheet. Fill each mold almost to the top. Bake the financiers for about 15 minutes. The cakes should be golden, springy to the touch and easy to pull away from the sides of the pan. Unmold the cakes as soon as you remove the pans from the oven. If necessary, run a blunt knife around the edges of the cakes to help ease them out of the pans. Transfer the cakes to a cooling rack and allow them to cool to room temperature.